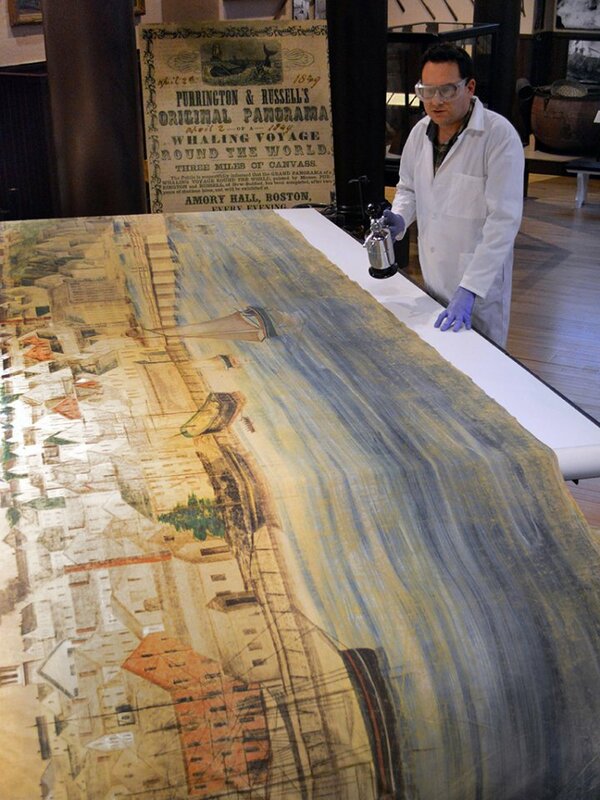 A Spectacle in Motion: The New Bedford Whaling Museum resurrects America’s longest painting. 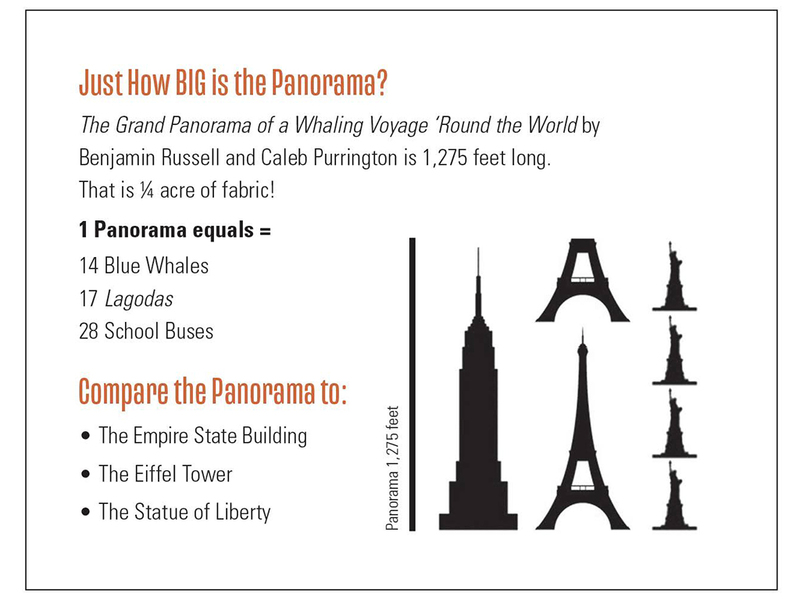 How big is a Panorama? Click the top image to get a larger version or to watch it in a slideshow. 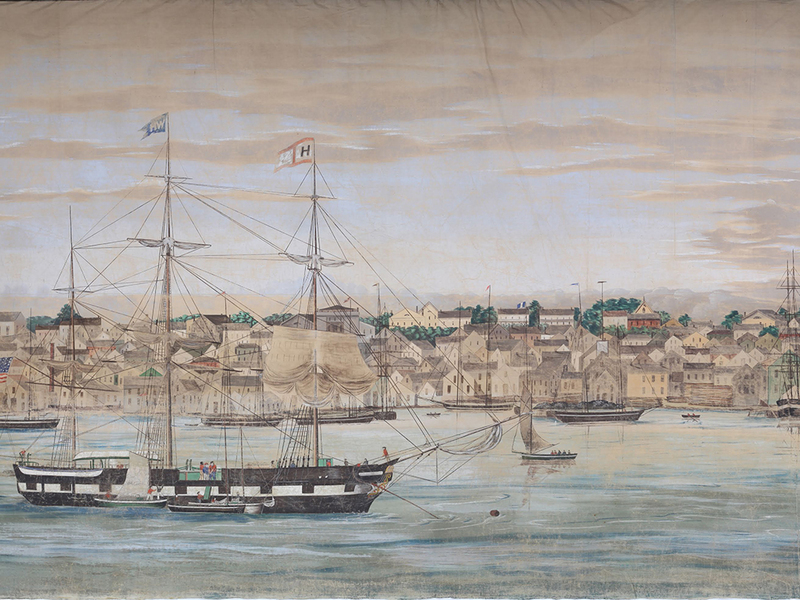 The New Bedford Whaling Museum resurrects America’s longest painting. See it this summer in New Bedford, Massachusetts. Before the age of cinema brought the world to life on film for audiences everywhere, curious people without the means or inclination to travel could be transported to exotic locales via a different kind of picture show: the moving panorama. For the first time in generations, audiences can see one of America’s few surviving moving panoramas in its entirety in New Bedford, Massachusetts. The incredible 1848 Grand Panorama of a Whaling Voyage ‘Round the World is America’s longest painting and the focus of two New Bedford Whaling Museum exhibitions opening in July. A Spectacle in Motion: The Original runs July 14 through October 8, 2018 and features the enormous painting itself - all 1,275 feet of it - in a stationary format at the historic Kilburn Mill in New Bedford. Opening on July 29 and running through 2021 at the Whaling Museum, A Spectacle in Motion: The Experience invites viewers to see the quarter-mile-long artwork as a moving picture show; much like audiences did during the 1800s. Visitors can stand on the bow of the world’s largest ship model, the Lagoda, and watch the Grand Panorama scroll by in large-scale digital format, projected in a theatrical setting. They will see the world as whalers did when leaving the port of New Bedford in search of whales. 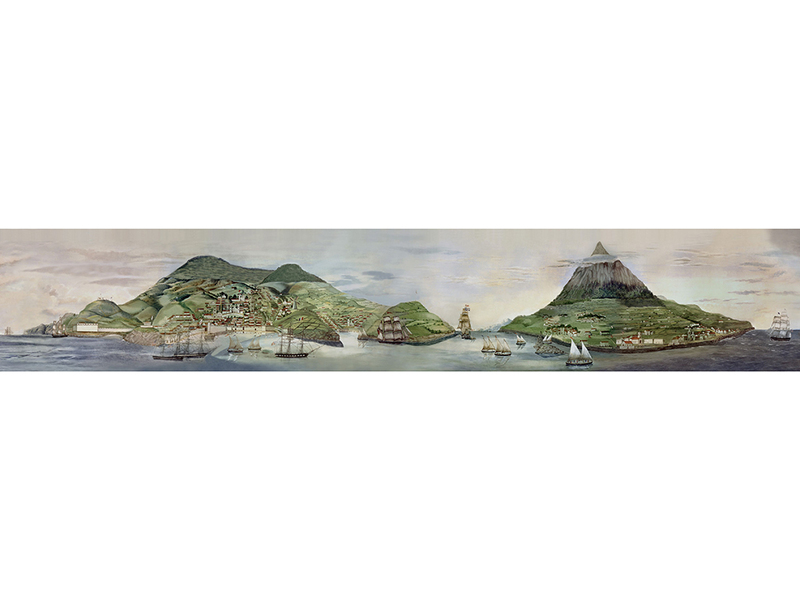 The recently conserved Grand Panorama of a Whaling Voyage ‘Round the World is a rare example of American panoramic art, a maritime artwork of national historical importance, and the world’s largest extant visual primary (meaning firsthand) record of a whaling voyage. Caleb Purrington (1812-1876) and Benjamin Russell (1804-1885) of New Bedford painted the Panorama in 1848, then took their creation on tour across the United States between the 1850s and 1870s as a moving picture spectacle. The panorama as a form of entertainment originated in Europe in the late 1700s, eventually making its way to the United States and reaching a peak of popularity in the mid-1800s. The word “panorama” means “all view.” These enormous paintings - some more than 500 feet long and forty feet high - were exhibited statically in round buildings called cycloramas. They literally encircled audiences, immersing viewers in scenes of exotic places, famous battles, and cityscapes. Robert Barker, who patented this exhibition style, said that spectators should feel like they were “really on the very spot,” as if they were part of the scene in a surrogate reality, an imaginary “Grand Tour” of the world. Popular literature, painting, architecture, and fashion, not to mention the expeditions of Napoleon, David Livingston, James Cook, and Sir John Franklin, fueled the panorama’s popularity, which brought the spectacle of the unknown to audiences eager for the exotic. The limitations of booking and performing these works in expensive permanent structures, led to the advent of moving panoramas, which, although often four times as long, were inherently mobile and cheaper to produce. Rather than the audience moving or turning through a space to experience the cycloramic panorama, moving panoramas such as the Whaling Museum’s, were mounted on large spools and displayed on structures that scrolled through the scenes much like celluloid film. This new type of panorama could be displayed in any large room or theater and would often be accompanied by narration, music, lighting, and other theatrics. Exotic subject matter was important to 19th century audiences, but so was authenticity. 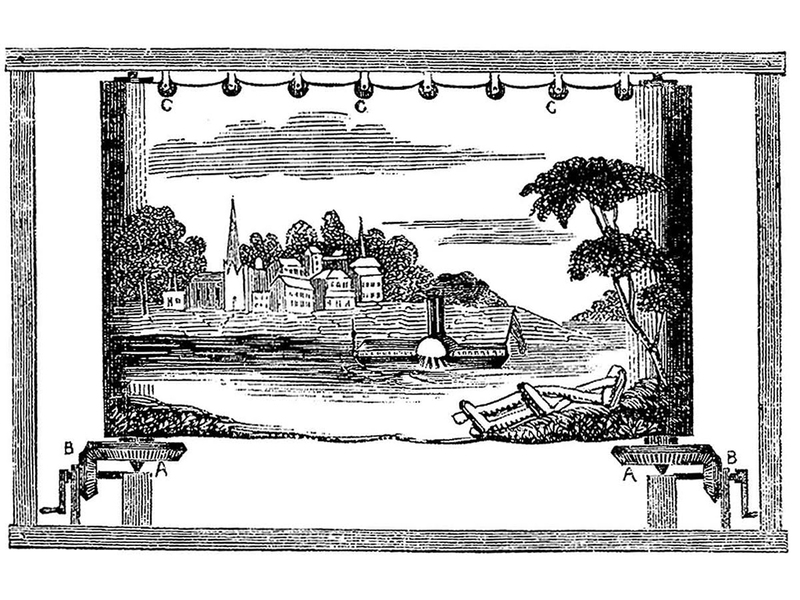 The Purrington-Russell panorama’s authority would have been justified by Russell’s personal experience as a whaleman and his attention to maritime, geographical, and architectural details. He spent 42 months (1841-1844) on a whaling voyage aboard the ship Kutusoff before beginning a career in earnest as a commercial artist. The Grand Panorama of a Whaling Voyage ‘Round the World has emerged from the past as if from a previously unknown foreign country, and the duo experiences of seeing it in its entirety as a work of art, and viewing it in motion in a theatrical setting, will surely count as one of the most singular and spectacular American folk art milestones of this modern era. A two-volume publication that dives into the detail and narrative of the Panorama accompanies the exhibitions.